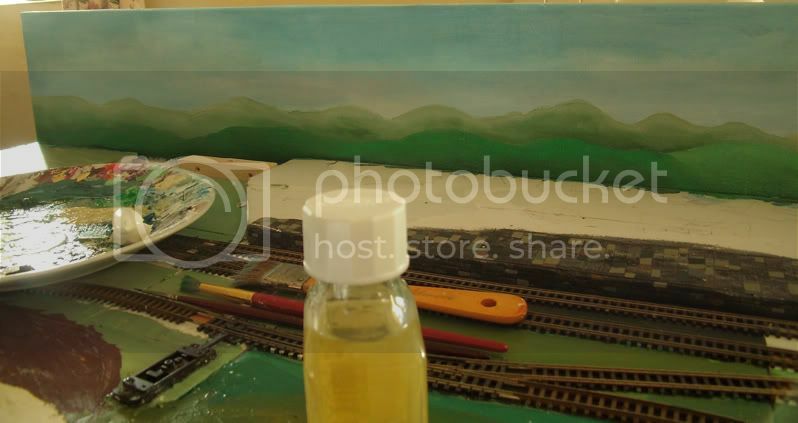 Yes, I finally made a start on the rebuild of Kilnevan, my little Irish branchline. Took some pictures the other day and finally got round to uploading them today. I've not taken any whilst reaching this stage so I'll give a description. The main, scenic board that you see is 4' long and 16" wide. It is made mainly from 40mm x 20.5mm timber from B&Q with some 20.5mm x 18mm for the backscene frame. Took a while to source as I went through the entire rack in the store checking for straightness. 5mm foamboard is added as a trackbase on top of this. So I have a layout that will be about the same weight as the old one but twice as strong. 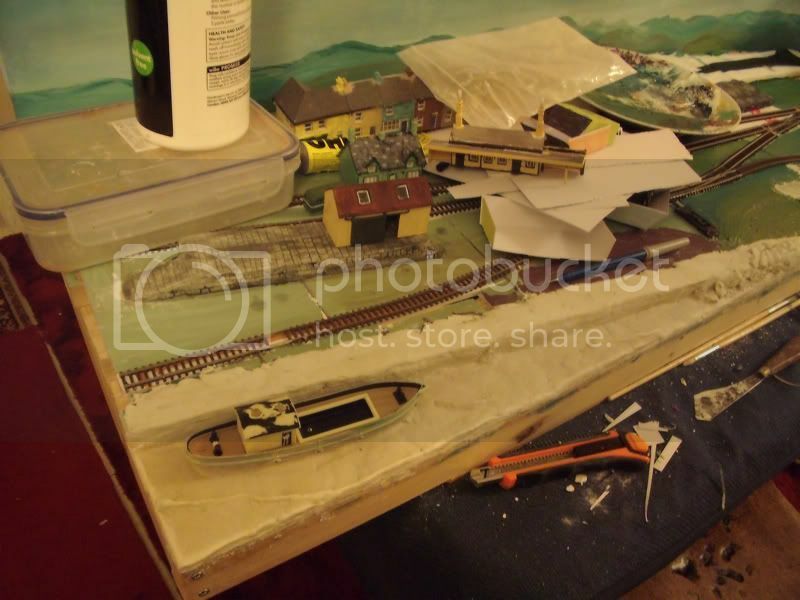 The fiddle yard is a 2' x 16" sliding traverser that is still under construction. to follow. I am trying a new type of backscene out, its called canvas. 2) what would sit on the back seat of the car as I intend to exhibit Kilnevan eventually. Inspiration comes a lot from the Timoleague and Courtmacsherry branch which closed in 1961. The station with the high street behind it on Kilnevan is deffo influenced by the same set up at Courtmacsherry! Points will be controlled by wooden doweling. Haven't got as far as couplings yet. Its not fixed down, just in place to see how it all fits in. Oh, and when I said 'eagle eyed' I wasn't referring to the old action man figures, unless your head is like that! It looks very promising. Keep us posted as to your progress. 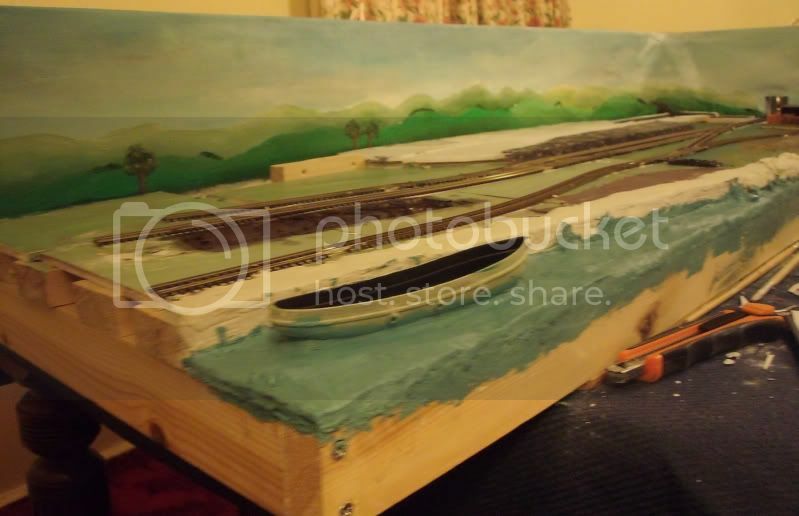 I've put the diorama in its rightful place now that the tracks laid. 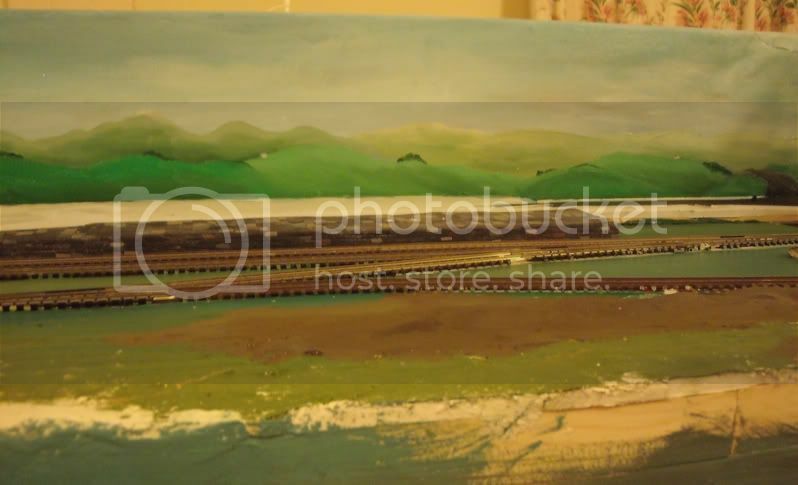 Painting has started on the backscene using acrylics. For the sky I've used Prussian Blue, Titanium White and a bit of Payne's Grey. I wanted some grey in the sky to avoid that perfect blue sky that everyone else has. Plus, a few grey clouds is far more 'Irish Summer Sky' to my eyes than one just in blue and white! Made a start on them hills! Some may turn out more mountainous than others. These are in just what I call a 'base' coat. More layers of detail will be built up in top of these. Sap Green, Hookers Green, Yellow Ochre and Raw Sienna have been used to far. 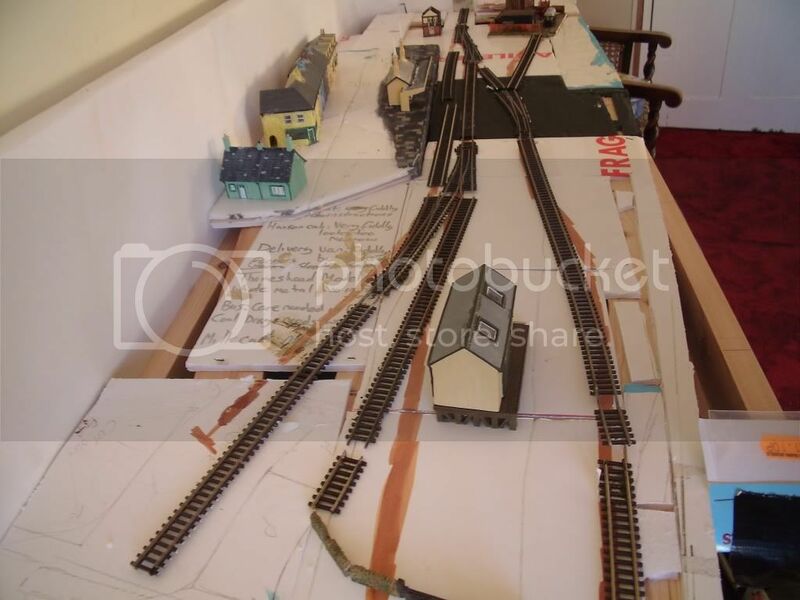 The train at the station is purely for an idea of scale and is not running yet as I've not wired up the layout! 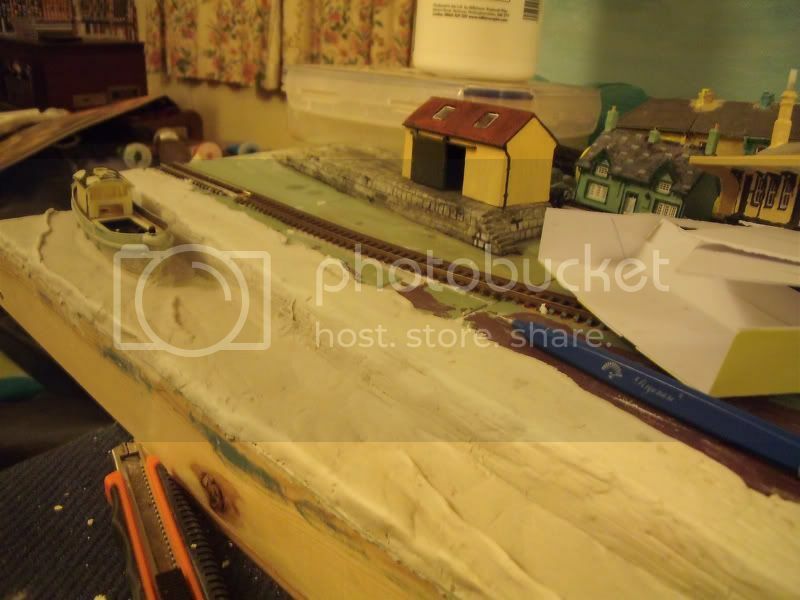 It's my half made C.I.E 'C' class diesel, an 1880's GSWR 6 wheeler and a C.I.E laminate. Valve Design make the diesel body, it runs on a Lifelike SD9 chassis and needs a lot of work yet! The coaches are in white undercoat and are both by Worsley Works. The 6 wheeler is on an old Farish coach chassis with a centre pair of wheels added. The Laminate runs on an old Lima MK1 chassis. 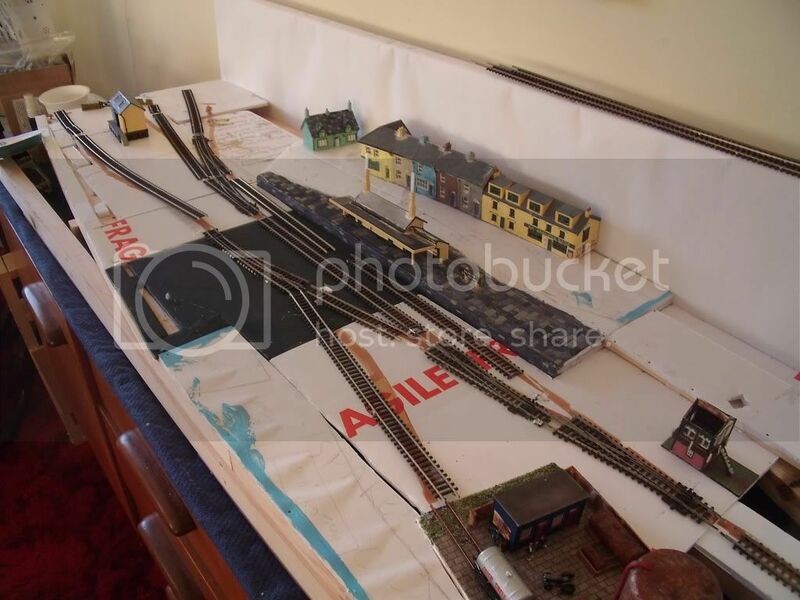 They are actually 2mm scale coaches, not N scale but as there's so little available in Irish outline in either scale I'm grateful for what there is and use both. That should annoy the purists nicely! 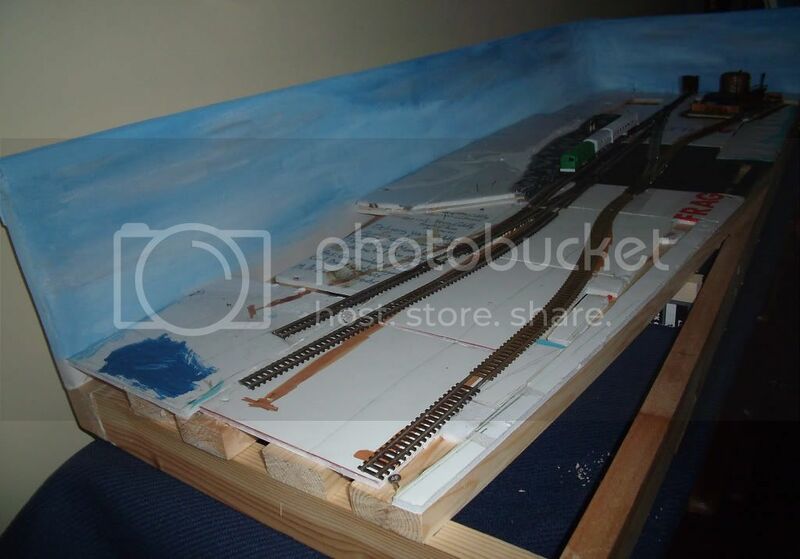 who was also a great railway modeller, that if you paint your own sky use blue, white and payne's grey. Don't need much as a little payne's grey goes a long way! The hills won't stay that shape as the gaps between them will be filled in with more hills. Need to check building heights and places again before I do that. Not easy as some aren't built yet! Then I'll add more detail. 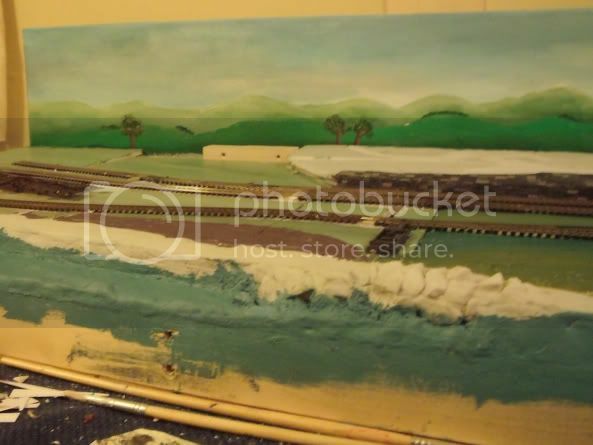 I think when you start the scenic work the hills on the backscene will blend nicely into the layout. Thanks DS, I think they will. Buildings are right in front of the backscene so I'll have to amend it accordingly so that they are visible to some degree. I'll do that as I go. Not done much to the layout as other things kept needing my time but I have made a start on adding the doweling for the points. Made some card mockups yesterday. Drew them up on the computer, to scale and just using a light grey for doors windows and edges. Printed onto some thick card, assembled and coloured in with some Pro-Marker pens. 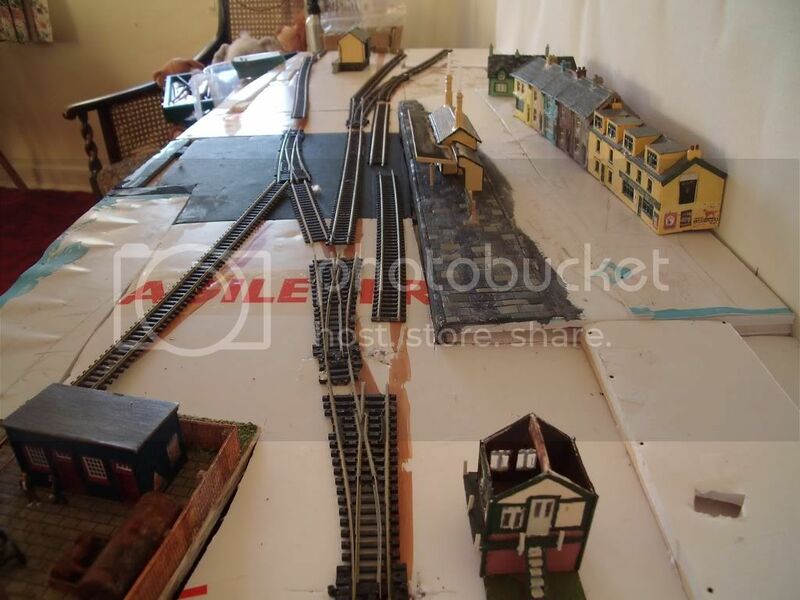 I'm having the church at the other end of the layout now, rather than across from the signal box. Well, I will when I build it! Been working also on some rolling stock as I now have a deadline to meet. 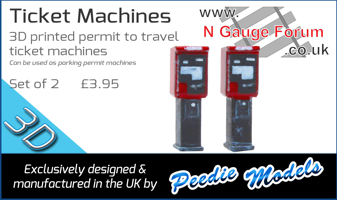 The observant amongst you will notice that my real name is on this, Moogle is just a nickname! The spelling I sent in for the event was actually a typo. It should of course be Cil Naomhan, not Cil Naobhan, but from what I've figured out its pronounced the same. Hopefully this weekend I can complete the point rodding (doweling). The way you've done your backscene is very impressive,I doubt my artistic abilities would produce anything anywhere near as impressive. Looking good Moogle! And I like your new avatar! I kept looking at the backscene and eventually got fed up of it. So I've repainted it. In oils! Done in 2 stages, sky and some hill outlines 1st and that took a week to dry. 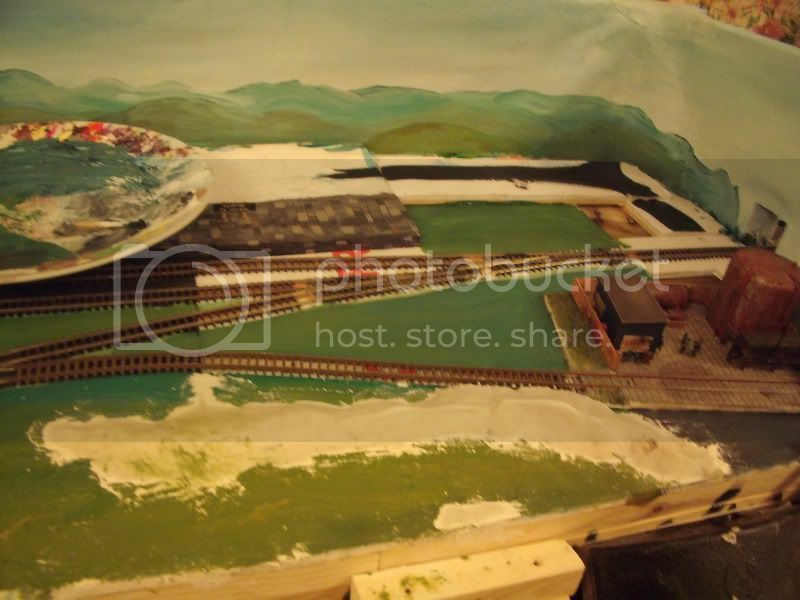 So I started on the harbour. For this I am using a product called 'Plastiroc' which is a paper based clay. Its air drying and you use it just like any other air drying clay, Das for example. I wanted waves, so sculpting the sea seemed the best way! The boat is a 'Thomas the Tank' toy I'm converting. Bulstrode I think it was called. Cost a quid at a boot fair! 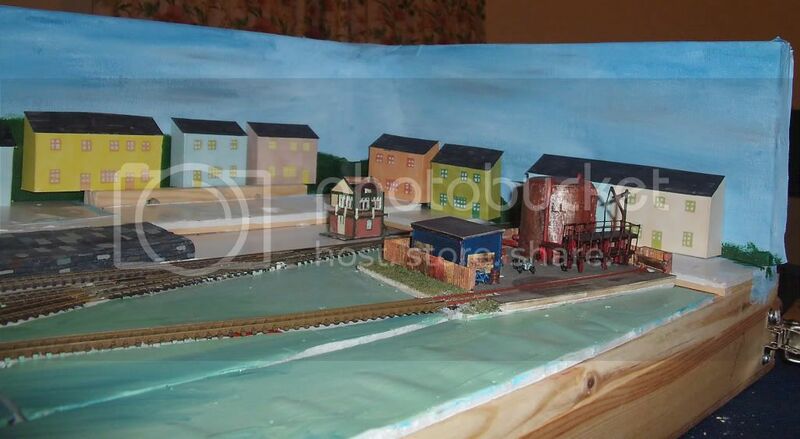 I used Plastiroc for an earth bank and to make the new goods shed/cattle dock platform too. 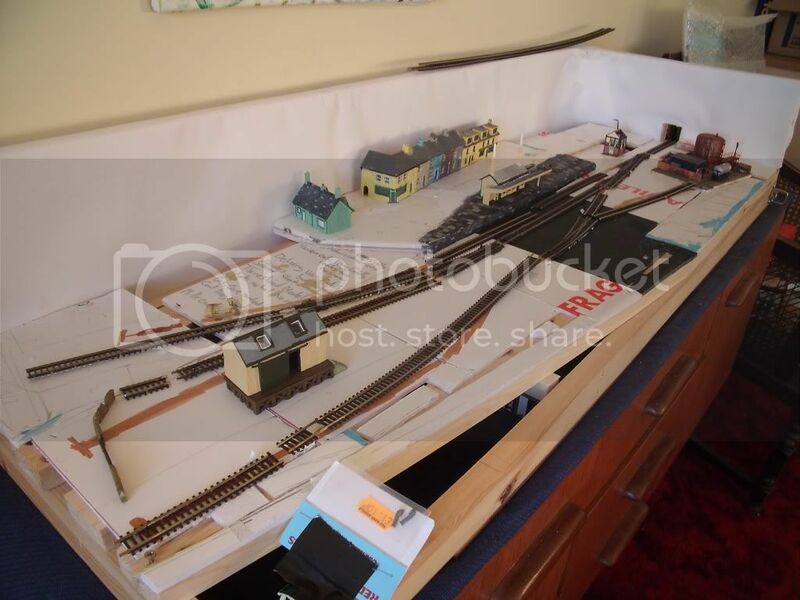 There's a lot of clutter on the layout in the above pictures, I am messy! Stage 2 started. More hills! These are a more detailed 'top' layer lot of hills. Then I added other details like trees. The Peco point motoer base won't have a point motor on it, I just needed it to clear a cross member for the wooden dowel and pin to reach! 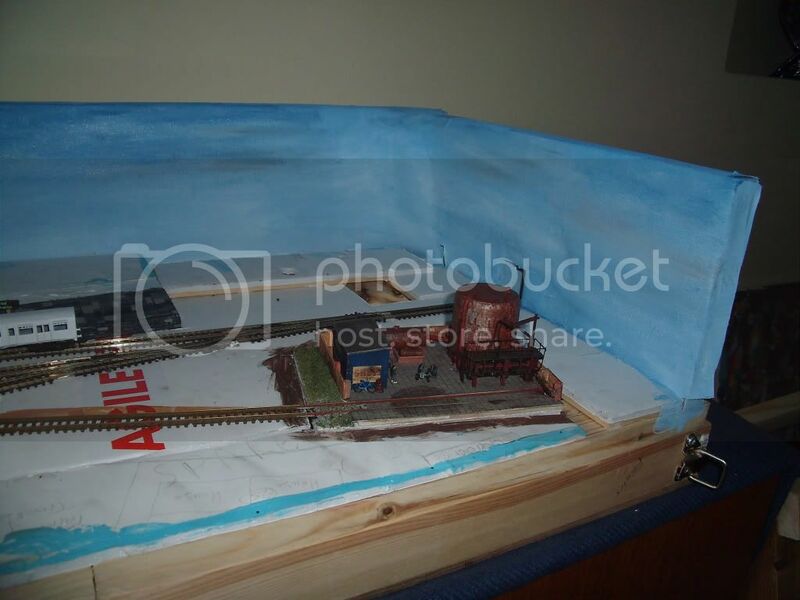 It will have a hut of some description covering it though. I'm planning a road junction on the corner so I've painted the road onto the backscene in preperation! I finished this today so its still wet. Might be dry by Christmas!